I'm Richard Gregory AKA Greg AKA Richie, I've completed a Computer Science degree at Liverpool University, a Phd and now in an RA postion continuing the work of the PhD. One of the exercises in the first year of the degree was to write a web page, so here it is. It has been updated each year to keep it reasonably up to date, though some of it hasn't been touched since I first wrote it all those years ago. This page hasn't been updated since 2001, which shows its age. Have instead focused on some various projects. Music, for self and others. Books, for those times when anything else is too much effort. People, who I hang out with. Games, of the computer variety. I also try to maintain and build on a large collection of useful(honestly!) fortune cookies. There are approx. 60000 fortune cookies available for grabs. They range from famous quotes (computer science, English literature, applied maths, pure maths, physics, psychology, The Simpsons) to jokes and sayings to political slogans. All in all, a very mixed bag which nobody has ever dared organise. A faded black and patchy light brown tabby that knows what he wants and how to get it. This picture was taken about a year before he died, it was one of the few chances I had to frame grab him. He was enjoying himself in the summer sun. Sadly Tibby's liver gave up and he spent some time in pain. He was put down in late October 1998 aged 19 years, smiling to the end. He continues to be missed. The next best thing to Tibby is another cat, so I now have Charley. 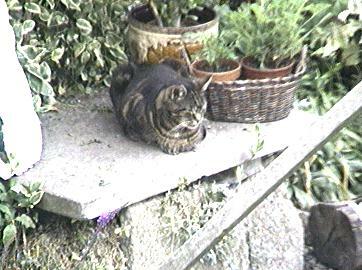 He was bought at local cattery who had rescued him from his previous owner, who kept him outside in a coal bunker. 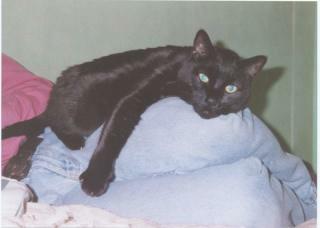 Charley is about 4 years old and the entirely black expect for a patch of 50%-50% black/white hairs on his chest. So far he doesn't speak to me much, he is just to timid and shy. I have seen his playful side every now and again, he should turn out to be a very nice cat when he recovers. My personal choice for music in the car and at home is fairly varied but includes the artists/groups Tori Amos, Portishead, Radiohead, Beauitiful South and Alanis Morissette. Needless to say, these links are a quick introduction and I don't always agree with what they say, I listen to the music not follow their lives. Obviously music is a personal choice, so in the company of others something like Euphoria Chilled fits in well. I would describe it as unobtrusive. When anything else is too much like hard work, I'll read a book by say... Robert Rankin, Terry Pratchet, Iain Banks and occasionally Patricia Cornwell. The old faithful Amiga 1200 retired when I graduated, it was replaced with a PC. Having had the pleasant experience of UNIX and the unpleasant experience of Windows, I decided a UNIX clone was the way to go. Linux was installed and I've have never looked back since. The only problem with Linux and all of UNIX seems to be the number of settings that can be changed to suit personal taste, it is too easy to spend a very long time making things just right. Most people I know don't have a web site and I'm not about to tell you about them when they can't themselves. However Peter, Steve and Paul all have ome form of home page. With the arrival of a PC came the possibilty to play some real games. A personal favorite is Unreal Tournement. The idea is easy enough, control a player from its visual point of view, run around and shoot everybody in sight. Not mentally taxing but that is the idea. The project on the go (before going to Liverpool University) was a texture mapped polygon 3D engine that aimed to be real time. It was the sort of thing that Descent and Quake became. Unfortunately it was held back by the lack of power my Amiga could supply and my inability to optimise the biggest slowdown of the algorithm - the use of a divide per pixel. The divide per pixel problem could have been sorted out, using some approximating algorithm or calculating every now and then but the speed of my Amiga still held it back. During Uni I've had time to do some small projects of various sizes, some of which are on the latter end of this page. PIC simulator - Software project that aims to simulate the internal workings of the PIC micro controller. One Cookie - Something to remove duplicate fortune cookies. Uses CRC checks and indexes to speed up the otherwise lengthy and memory intensive process. Snake - An investigation into the movements involved in simulating walking. In this case it was a snake (okay so it doesn`t actually walk...). Other ideas tested have been on quad and many legged cyber creatures. That this project needs is a little more design now some of the problems have been highlighted. During the first year of uni I was an enthusiastic poster on Fidonet; a amateur electronic mail network that spreads one way or another around the world. In practice the actual coverage is variable since the service provided is free, mail transfer is paid for by the kind efforts of the owners of each BBS the mail is passed between. A BBS can be called by anyone with a modem, computer and terminal. With the right software you can then select mail areas to join and read/send messages into those areas without being on the phone. Area topics are diverse, the system I call has approximately 1200 areas. Obviously most are for computers of different platforms but a large number are for just about any general topic or hobby that is vaguely popular. So what are the problems? Unlike Usenet, mail is transferred between BBS's at night in clumps and so message can take a few days to cross the country (yet they sometimes take the same time to deliver across to east Europe). Another problem is reliability, sometimes a BBS will disappear because of hardware problems or the operator has suddenly had enough. This can then make messages disappear altogether or take weeks to appear. A related problem is the overall reliability of message transfer, messages have been known to disappear and old messages that should have been removed can appear again. All this is caused by bugs in the mailer software used by various platforms to transfer the mail; although some of these bugs are fixed there is always new software coming out that will have new bugs. All in all it`s a bit rough around the edges at times but the characters can be friendlier than Usenet since the audience is smaller. During the second year of Uni, I left Fidonet because of the decreasing traffic level, decreasing number of interesting people and the increasing number of idiots that came with the arrival of the 'web surfing' fad. I reckon the whole scene was dying with the arrival of easy access to the internet and Usenet which gave generally much better performance for those people who just can't wait (most people). When I started Uni I had just built a model boat and was trying to learn to fly a model helicopter. The boat was more of an electronics project than anything else, all the control electronics was home brew (diagrams below). Once the boat was completed it lost it's appeal as there is only so much you can do with it; though I suppose you could say that with most things. The helicopter was put to one side when I had a near miss with a rotor blade. Having just taken off, hovered and then landed (it is not as easy as it sounds); I was revving it up to take off again when one of the main rotors flew off at incredible speed and the helicopter shook itself apart. Its things like that that make you notice just how fragile things (you, it) are. The bottom line is that a helicopter needs more effort to maintain than I am prepared to expend, all those moving parts need to be kept freely moving. Currently the helicopter has been rebuilt and is ready to try again using my newfound experience of fixed wing flying machines, but I'm in no rush as the maintenance problem will still be there and so will the inevitable engine failure leading to certain doom. At some point I got involved in flying and building a model plane, which led to other planes. I started to fly a Super Sixty, which is a basic training model of 60" wing span used by novices to get the basics of flying; such as hand-eye coordination, model orientation (model's left/right opposed to the pilot's left/right). In my opinion the Super Sixty is a reasonable model for the beginner, it is stable and forgiving but is easily broken having a fuselage constructed like a high tension power line made of 1/4" balsa wood. It also requires calm conditions as it's slow speed and lightness make it easily blown around useless you are experienced enough to control it. Since then (progress was quite quick) I've moved to flying a Mascot, this is a 56" wing span fast trainer made of plywood with veneer covered foam wings. It was bought second hand (cheapest way of doing things) and was distressed before I had it, since then it has had countless flights and 5 crashes of varying severity. At some point point the Mascot was retired; to be eventually sold to a beginner. In its place was a Baby Boss, a small very fast highly agile model. Apart from teaching and test flying other models, this has been the plane of choice for months now (possibly a year). Though it looks nice this plane feels under powered and so flying it is a potential risk. Also, through experience it has shown to be difficult to land accurately in even the slightest gust because the the wings lift varies with even the slightest change in airspeed. Another scale model, this one has seen better days though. When it first had the above engine installed it was a great flyer. It was fast, stable and had the power to nearly manage a sustained vertical climb. Somewhere along the line it must have been crashed and since then something is badly wrong with the airframe. Picking up speed above say half throttle will make the plane roll slowly to the right and not respond to ailerons or rudder. The only course of action is to use the elevator to slow it down and then at that point every thing works. Needless to say this problem is a hindrance, but as the airframe seems to be without fault there is not a lot that can be done without stripping the covering off. Since installing the 91 four stroke this model clearly has the power. Unfortunately the engine has turned out to be unreliable, aside from important bolts dropping out (some of the others were loose too), the idle mixture needle has somehow moving making the engine very rich. Trouble is, when installed in the model you can't get at the idle mixture screw and so I am currently waiting for that combination of being home during the daylight hours and good weather; so that I can set it up on a test stand. Though an easy flyer and well suited to the job of towing the glider, the pilot at the time somehow managed to stall it on the final approach. All but the radio equipment was smashed to pieces. This was bought second hand and after a lot of time ignoring it, I pulled it from the loft and fitted the above engine. Bear in mind that a 46 was probably the targeted engine. I found it a tight fit in the fuse, the engine sides pushed the fuse sides apart slightly. But anyway. I tried it and smashed it up. On takeoff everything was fine, but at the point that I came to turn around (as it was now some way away) I noticed the elevator wasn't responding, the other controls were fine but the plane continued to dive and dive. In total it did a perfect arc, from level to vertical ; at which point it hit the ground (with full power on at all times). This little accident smashed the model, the engine and damaged the radio receiver. All because the elevator push rod (fitted by the previous owner) couldn't take the strain on the elevator. Instead of pushing it just bent to one side. I know this because is was one of the few parts of the model that remained intact. A standard sized vintage look alike, similar to the Gangster but has older styling. Though it has been mostly built for a year now, that is as far as its got. A scale jet - the same thing the Red Arrows fly. Still boxed, it is loft bound and I expect it to be for a long time yet. Designed for the sole purpose of performing every possible acrobatic maneuver by using the brute force of agility. I am still flying this after what must be a year of use. The only crashes have been loops to low to the ground and rough landings caused by the Babys inability to glide. The only thing any of this has ever done is bend the under carriage. Designed to be slow and self leveling. A good trainer if you are prepared to built it. Beware though, wings can warp in the sun (all built up wings do, but these seem to do so more than most). Designed to be tough and be reasonably fast. Is partially self leveling and will do most maneuvers, if not very tidily. This model has since been sold to another beginner in the club. Although he got the hang of flying it within maybe 8 lessons (8 tanks of fuel), he crashed it and after the repair it has developed scary tendency to do a sharp right roll when initiating a left roll (as part of a banked turn). By sharp I mean it will roll from say -10 degrees (left bank) to +45 degrees in the blink of an eye. Still trying to track this problem down. As the name suggests a glider. This is based on the classic glider design unlike modern model gliders which don't look like the real thing. Being a glider it has no power of its own and must be towed or piggy-backed to a usable height, when it is released and the object is then to find some thermals to 'keep it up'. Being of traditional design this is made of balsa and doped tissue, unlike most nowadays which are made of plastic covered foam or possibly fiber glass. Exact scale model of the real thing. This has now been built, but after spending well over a year making it (on and off) no one has the balls to try it, besides the trouble of landing it a 20x20 yard grass landing strip. A plane for the same niche as the Baby Boss, but larger, much better looking. Have still to get used to this one, as the colour scheme makes its difficult to see which way up it is; unlike the Boss which has an orange underside and white top. All in all, it flies straighter than the Boss and looks better. Third scale of the full size vintage. Has flown a few times but the cost of the model and the time spent building it make it a model for ideal conditions. Bought second hand, this model is still being done up to the point that it will fly again. Apparently it used to be used as a trainer, though with a 108 two stroke engine. Not bad looking but difficult to fly (because orientation is difficult), stalls badly when upside down. Hence its been pending major repairs for months now. A bigger but lighter version of the Baby Boss, a very popular model because of its agility and resilience. Alongside the description are some details of the models wingspan, the size of the engine that powers it (in 1/100th of cubic inch) and the make of engine. I also like the occasional bit of electronics, usually either gizmos for use on the phone, something in one of the models or something for the computer. I plan to put the circuit diagrams of a few select circuits here when I can make the space to put them in. Using Linux, full load created with gzip < /dev/urandom > /dev/null, mpg123 was used to play an mp3 on the C400, mpg321 was used on the C3. This was for a Celeron 400 in a complete system. TNT2 gfx, sound card, network card, cdrom, 5400 rpm hd and 256 meg of PC100. The monitor was a 17" low end of the market (1280x1024 at 60 Hz, rather than at 85 Hz). The 12V to ATX power supply is now complete and tested. The board layout is available here (eps), which implements the schematic found at the above link (which themselves came from datasheets) and also includes a full ATX style ON/OFF from this(eps) schematic. In making the board I spotted some problems with this layout. The ground wires are too hard to get to, the -5V bits should have been moved further right to make more room. Forget the Power Good signal, turns out there was enough room on the bottom left of the board to add the capacitor and resister that the reference used. Would have be better to use the bottom right. While the power supply is on, powering the Celeron 400, the 5V regulator gets really hot and needs a large heatsink. By itself it is too hot to touch in 20 seconds. For the Celeron 400, all other parts ran cool - even the 3.3V regulator. Suggests there is a cut off point above which the regs will need a good heatsink - even though the worst case showed the 3.3/5V regs would give off around 7 W each. So, the layout of the regs I used isn't the most ideal for easy heatsinking. The heavy diodes all ran cold and so are fine as they are. In the BIOS the whole system was drawing 2.5A from the 12V supply. Testing on the Cyrix 3 533, running at 266 Mhz, the 5V reg didn't get quite as hot, and the 3.3V reg was hotter than before. At around 2A on the 12V supply this generally drew less current so it was to be expected. Putting the system into sleep mode it draws 1A, but as the CPU fan was still running, I suspect it can go lower. NFSU2 can create LAN based games of its own without using EA's server, normally this is limited to machines on the same subnet as the game cannot be told where the server/clients IPs. This program looks for servers on the local subnets and tells remote machines about the server. The combination of this packet relay utility and a Linux VPN (or lots of port forwards) will enable cross LAN 'LAN' based games of NFS 2. Page is here. Linux i386 hardware based watchdog timer, that is a device that resets the computer if it crashes and locks up. Typically Used for remote adminstration. Given here is the circuit diagram which plugs into the 5-1/4 floppy drive connector and the source code for the watchdog daemon. More details are available from the above link. Since aquiring some 19" sync-on-green monitors a few years ago, they had always been tied to the low spec computer they came with because the monitor only supported the sync-on-green method of signalling a new line and new frame. Some careful research shows that the extraction of the syncs from green is done by a M52001SP sync signal processor. As the name suggests this is a general purpose chip that can derive a sync from several sources, on green, composite or seperate horizontal/vertial. Even more fortunate was the circuit layout ready to take the pair of 4.7uF capacitors. All it needed was BNC plugs fitting and an obvious pair of link wires. With some tweaking and a supported graphics card it would be possible to use the frame buffer device to generate a high enough frequency to use a text console. Not many cards are supported enough to change the clock rate so the chances are low. Decodes the pulse width output of a standard radio control receiver and generates a 0 to 100% duty cycle output that will drive around 100 Amps. This one is very big and definitely isn`t recommended for beginners. The circuit uses a constant current source to charge a capacitor for the length of time the PWM input is high, the p.d. that it charged to is directly proportional to the length of time the PWM input was high. This is then used as the maximum p.d. for another timer which is continuously triggered and stopped when it reaches the first p.d.. Simple? No, but explaining is difficult. Decodes the pulse width output of a standard radio control receiver and switches a relay on or off depending on the pulse width. Small circuit to support the speed controller (since it required a minimum of around 8 volts (for the op-amp) but running off batteries this couldn`t be assured for long periods of time. Active monitor that lights a few LEDs depending on the status of the phone line. Uses only 14uA when the phone is idle. Delays the ring of the phone by one RING. Used by some people to disable the initial ring of most phones in the house, leaving only one undelayed phone to be answered quickly. The circuit operates similar to the Auto phone pickup below but instead of directly triggering a relay it triggers a timer which triggers a relay for a short period of time. Diagram showing the three components inside an standard BT master box. The capacitor and the resister are for the ring (actually just the capacitor is for the ring, the resister lets the exchange test the capacitor without a phone having to be plugged in. Pub game circuit, designed and built to the concept from a customer, a guy from Greece who wanted something more than the usual pub junk. It measures and displays the time between picking up a pint glass and putting it down again (drinking all the contents ASAP). The display houses the main circuit and power supply, a small box which is just a sturdy sensitive switch is connected via a lead a short distance away (so others can see it). Operation is the circuit is relatively simple, a 555 wired in multivibrator mode generates a 100Hz clock signal which is cascaded down three decimal counters(each having a built in display driver). There is also another 555 to reduced the bounce when a glass lands. Only problem with this circuit is the accuracy, at around +-1.5% frequency drift that last digit counting the 100th's was practically useless, not that anybody would notice. Another problem with this design (or rather size of display LEDs) is that the drivers in the counters couldn`t drive the LEDs directly, needing two resisters and a transistor for each of the 21 elements. A PIC series micro controller programmer, that is a complete (if simple) computer on a chip made by one of the many manufacturers. This project was a part software (to drive the programming hardware) and part electronics, the programming hardware itself. The hardware is ultimately just a voltage level converter and a fake disk drive controller. The voltage level converter deals with the signaling voltage difference between the Amiga and the PIC, the biggest problem is a tri-state (0V, 5V, 12V) output to the PIC. The fake drive controller allows the hardware to be coupled to the floppy drive bus and so not use any commonly used ports. While modeling I found I needed to charge some unusual batteries so I designed this device which allows a adjustable amount of charge current. It is adjustable from 20mA to 500mA using a Buck converter. This is a scaled down version of something I plan to implement using a micro controller, then I'd be able to implement peak detection and other nice features. I`ve also got some notes on various frequencies, timing and p.d./current aspects of the digital exchanges as well as various test numbers and other interesting bits. I`ll put these on when they`ve been edited into some sort of order. Some of the above was in the past, nowadays I put my skills learnt doing the above to some real world problems. These particular problems are the sort that should not be advertised here in case it reduces my freedom.